I think the KIDS SPF 30 Sunscreen Spray would be best for us as we'll live at the lake this summer. The footspray sounds nice too. 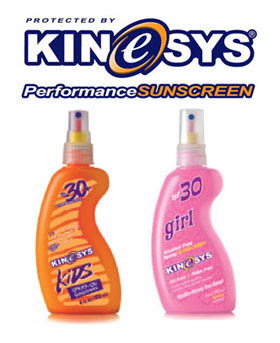 The Funscreen SPF 30 sunscreen spray for kids would be great for us. I like that it dries fast with no rubbing. The kids sunscreen cream. i have always had issues with our sprays getting clogged after several uses. I hate having to open it and pour it in my hand because it is to runny. I am curious to see how their spray works. My family could really use the Kids and Parent Kit. We'd be using the fire out of that Kids SPF 30. With two little ones, spray sunscreen is definitely the way to go. No trying to hold them down while you lather them up. Love to have KIDS SPF 30 Sunscreen Spray for summer. It looks like it would stay on! The Kids SPF 30 Sunscreen Spray would be a great match for our family--highly rated on Environmental Working Group's website, and doesn't contain any nut products (my son is allergic to nuts, so no almond oil and no shea butter). My e-mail is arb54arb54 at rcn dot com. Thanks for the giveaway! I think the Complete Family Kit would fit our needs! If I couldn't pick a sunscreen spray, I think the footspray would come in handy for my family. the KIDS SPF 30 Sunscreen Spray would be great for us! I think my son who plays football would LOVE the anelgesic sports stick. I like SPF 15 Performance Moisturizer.